Getting the children to events can be one of your biggest challenges. 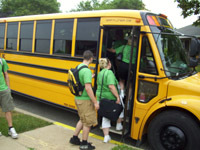 While some parents have the means and motivation to provide transportation for their children to attend events, you will find that more children can participate if transportation is provided. The primary source of transportation for Keystone Kids events is the local agencies for the blind in the counties where the children live. You can contact your local agency for the blind to see if they are willing to provide transportation for children to attend your program. Another option is to recruit volunteers to bring the children. 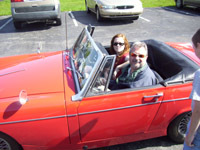 Lions Clubs are often a good source of volunteer drivers. One Lion might take kids to an event and another could provide transportation back home. As a “thank you” for the Lions, some of the children could present a slide show or video of their events at a Lions’ club meeting. This makes a great program for the Lions and is also a good public speaking opportunity for the children. You will need to make sure that all of your volunteer drivers have their clearances (child abuse history and criminal record check) and current insurance.